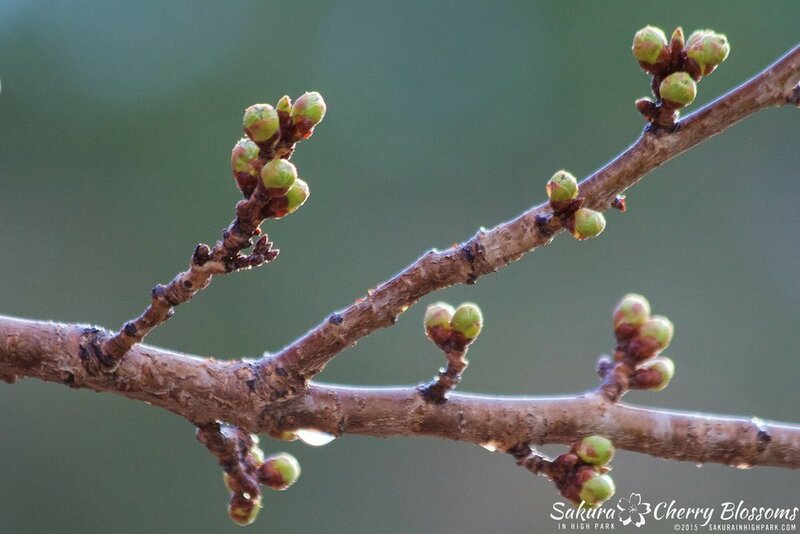 Sakura Watch, April 21, 2015 - my rain-soaked visit to the park today saw the showers have helped the sakura buds to swell bigger, rounder with excellent progress overall! Braving the wild winds and wet weather was worth the effort once I saw how even a few days of decent sun and rain can help the sakura trees to produce larger, rounder and greener buds. I was also treated to a rainbow behind the sakura trees (see the photo in the gallery below)! The trees near the sports fields are the farther along and are even looking to be soon moving onto Stage 3 in the bud development cycle! These are easily seen as very large, round and bright green with hints of pink and there are plentiful in number which bodes well in seeing a better turn out of blossoms this year. Walking down the big hill and winding trail also see great bud development that are only a little less developed in size and shape as you venture lower towards Grenadier Pond. The sakura // cherry blossom buds in this grove are definitely looking great though so no worries on seeing another positive turn-out of white blossoms in the weeks ahead. Once again walking through the trees near the High Park Zoo and Adventure Playground show the slowest progress in the park, but when the time comes, they will definitely be offering a beautiful sight for all to see. Tomorrow will be Earth Day (April 22, 2015) and I hope we all take a moment to remember that as much as we share a passion for the cherry blossoms, they are only a fraction of the many more amazing things that mother nature offers to entice our senses and well being. Let's all take a day to be thankful for all she offers and help ensure that it can continue for many more years to come! Watch for more updates to come later this week!